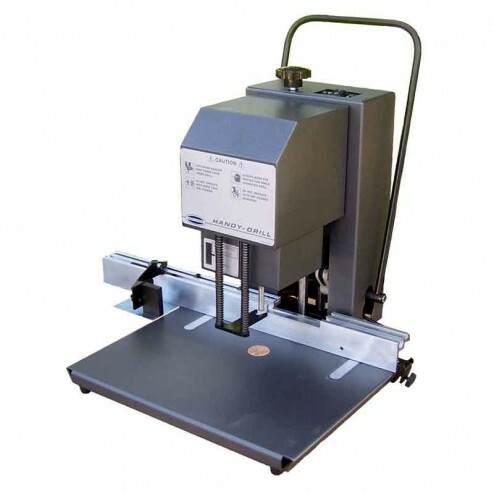 The Challenge Handy-Drill Paper Drill-CMC-332 saves time and money. The Challenge Handy-Drill Paper Drill has a standard 2 1/2" drilling capacity and comes with both a 1/4" and 5/16" Challenge drill bit. Machine can be converted to or ordered as a 2" standard drill capacity to accommodate a wider range of 13 available hole sizes. The spindle motor automatically turns on when the pull-down lever is moved and automatically switches off when the lever returns to the up position. Dimensions (HxLxW): 22-3/8" x 21.2"x 24"
115 Volt, 60 Hz, Single-Phase, AC., Spindle Motor: 2.7 Amps. Power cord included.